After numerous troubles and repairs, and about 1280 miles of travel, we have finally made it to the Bahamas! After waiting for a while in Miami for the right weather window, we finally got one. We moved to a staging anchorage for a night, a spot that is right next to the inlet leading to the ocean. On the way there, we practiced man-overboard drills. We left at four in the morning and had an easy crossing of the ocean to the Bahamas. 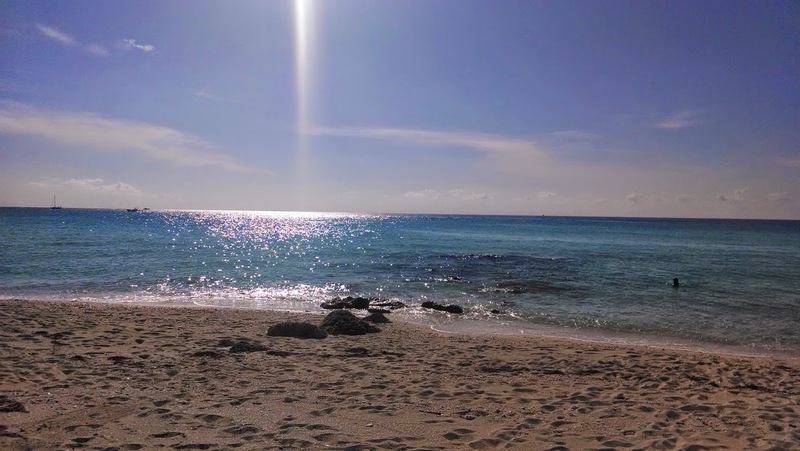 We arrived at Bimini, and for the next three days we went to the beach, snorkeled the rocks, and played pool in the same place where Ernest Hemingway " drank, brawled, and wrote his way through several fishing seasons." To get across the ocean, we needed to have the right “weather window”. In the Gulf Stream, the current is always flowing north. The Trade Winds, which blow from the east-southeast, are the prevailing winds. That means that usually they would be blowing directly against a boat wanting to cross from west to east. Sometimes weather patterns cause the winds to shift. When the wind is from the south or west, sailing in that direction is good. However, when the wind is coming from the north, against the current, it creates large waves and unpleasant and even dangerous conditions. We waited for weeks for the right weather. Finally, we had a weather window – a couple days with little to no wind. We had to motor all the way, but here we are in the Bahamas. it into the water as fast as possible. The man-overboard pole consists of a vertical floating pole with a flag on top to mark where the person is. Attached to the pole with floating line is a horseshoe-shaped float for the person to hang on to. We would circle around the fender and grab it with the boat hook, and then pick up the man-overboard pole. If it were a real man overboard situation, we would also throw out a life ring and use it to lift him on to the boat by attaching it to a halyard. (We practiced this too.) 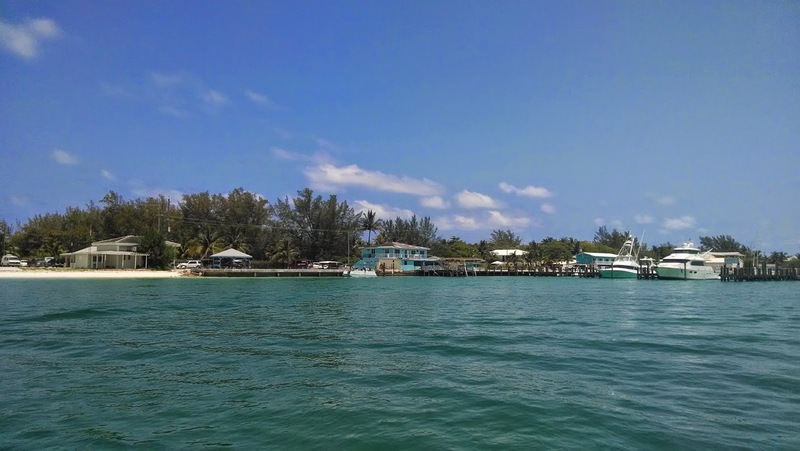 Then we anchored at our staging anchorage, No Name Harbor, right next to the "Florida Cut", a break in the keys and reefs which would be our passage to the Atlantic. 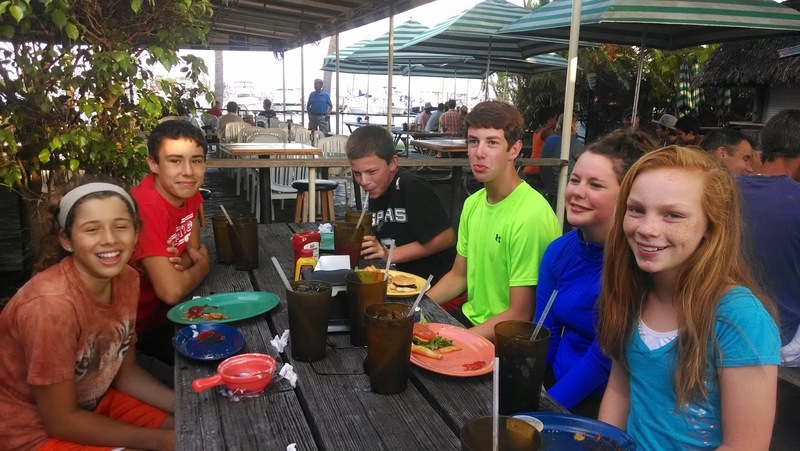 We had met another cruising family in Miami that had a 14 year old son named Eric and a 12 year old daughter named Claire. 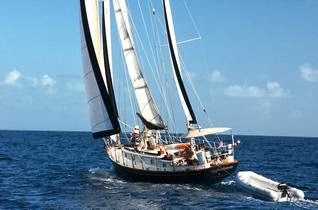 They were also going to the Bahamas and they were anchored next to us on their boat Palantir. We got up at three in the morning and left at four along with our friends. We went slowly and carefully out of the cut because it was shallow and unmarked. 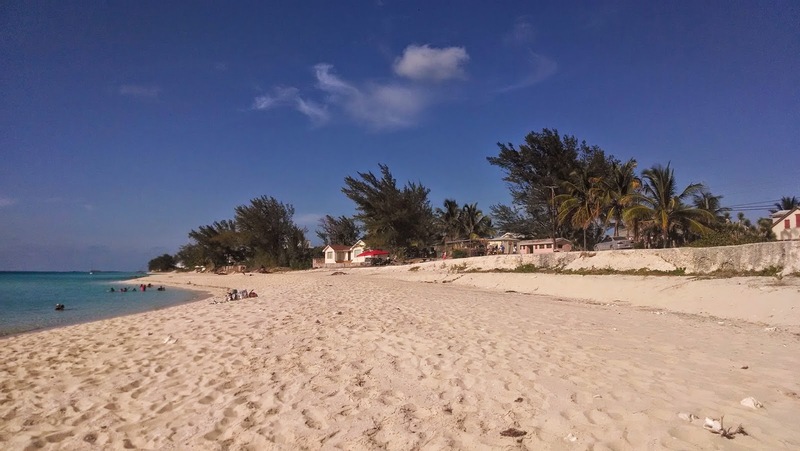 After we got out of the channel, all we needed to do was travel in a direct line to get to the island of Bimini in the very western Bahamas, except that the Gulf Stream current would push us north, so we had to constantly adjust our angle. When we got to the deep ocean, the water was amazing - the bluest blue you’ve ever seen. 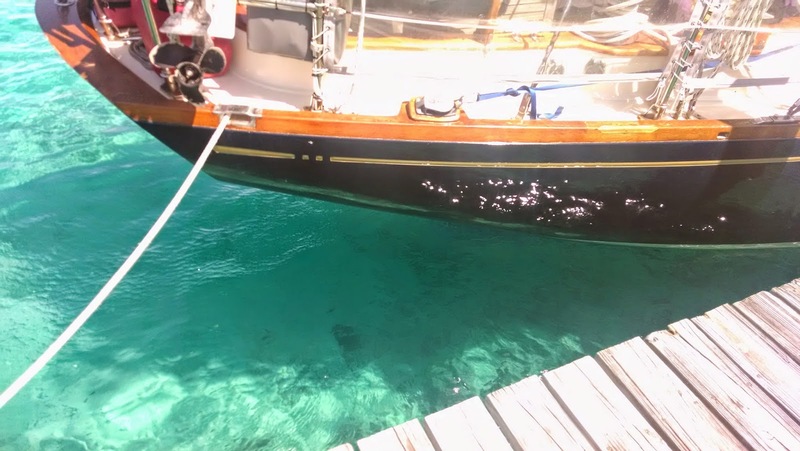 Nothing special happened (That’s surprising, based on past experience haha), and we got to Bimini at noon after motoring for eight hours. 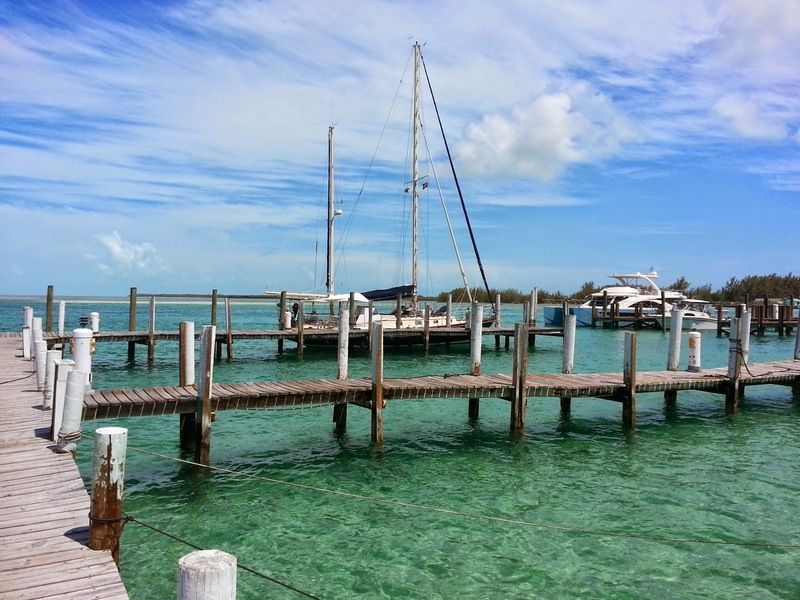 Coming in the entrance channel that led to Bimini, the water was a mix of different colors, turning from the blue of the ocean to green as the water got shallower to a turquoise color in the channel. We could see all the way to the bottom! Large rays were swimming along, and a huge one jumped sideways out of the water. Half an hour later, we got to Weech’s Marina and docked. This was first time in a different country for Nicole and me. We were finally in the Bahamas! We were immediately met by the dockhand who gave us our customs and immigration papers, and he introduced himself as Kimini from Bimini. 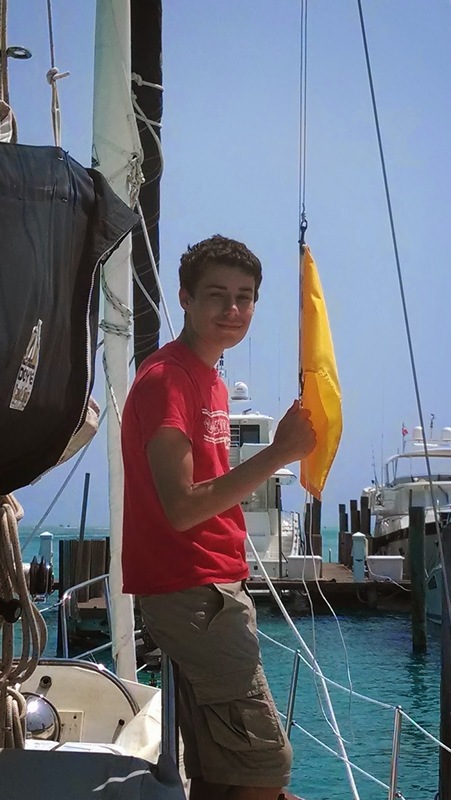 We raised the quarantine flag – the solid yellow Q flag – which is required by law to be raised on the starboard flag halyard until a boat checks in with Immigration. Once cleared, a boat can choose to raise a courtesy flag of that country (which we did). 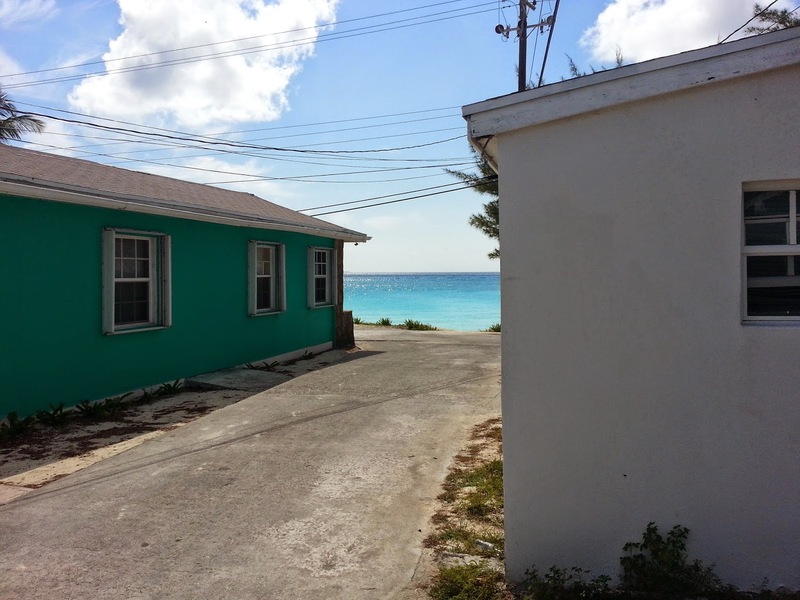 Alicetown in Bimini is basically a one road town. 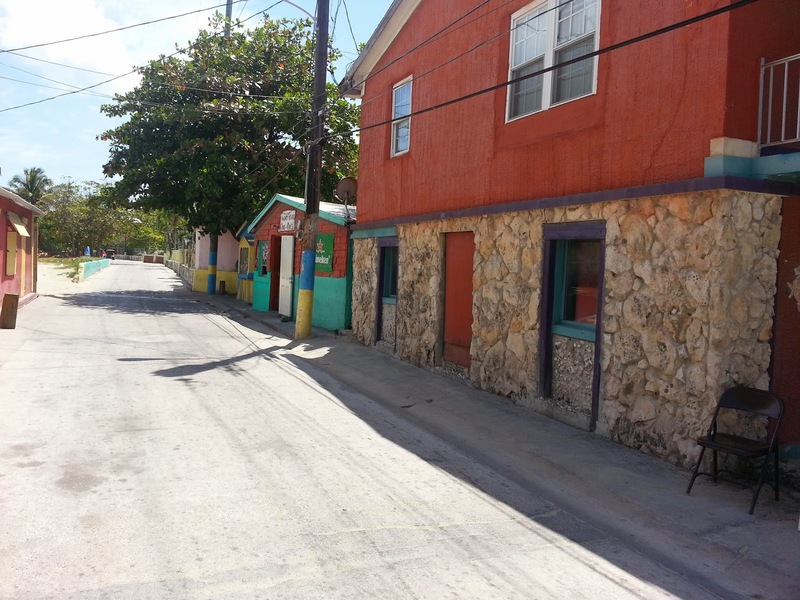 There is a dusty main road that leads to the north part of the island, and a few short cross streets. 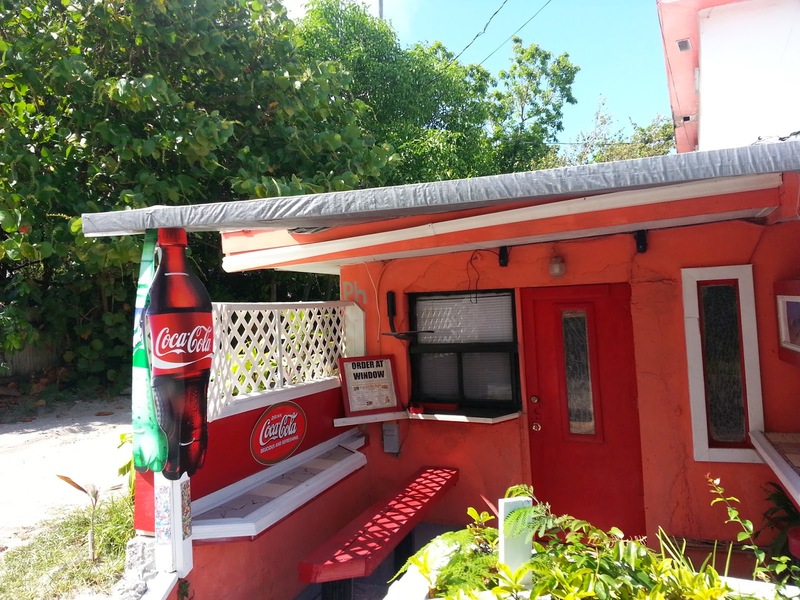 A long concrete wall by the sidewalk was topped with conch shells. Further on was a grassy field that had been turned into a makeshift bar. The table there held many large bottles of beer and rum, and a DJ with a Mac was playing really loud music through big speakers. People were sitting around talking and drinking. Another bar was blasting music so loud that it hurt our ears on the other side of the street. The main road was very narrow – it probably would be considered a one-way street in the U.S. – and the cars and golf carts came so close to us that we had to walk single file. There was no place to swim by our dock because it was along the channel where the power boats zoomed by. Also, the people in the next marina had regularly-scheduled bull shark feedings. Luckily, the marina where are friends were docked, the Big Game Club, had a pool. It was extremely hot compared to what we were used to, so the water in the pool felt great. After dinner at the restaurant, we found a pool table in an outside area and we played all night. For the next two days, we went to the beach. For the next two nights, we played pool as much as possible. 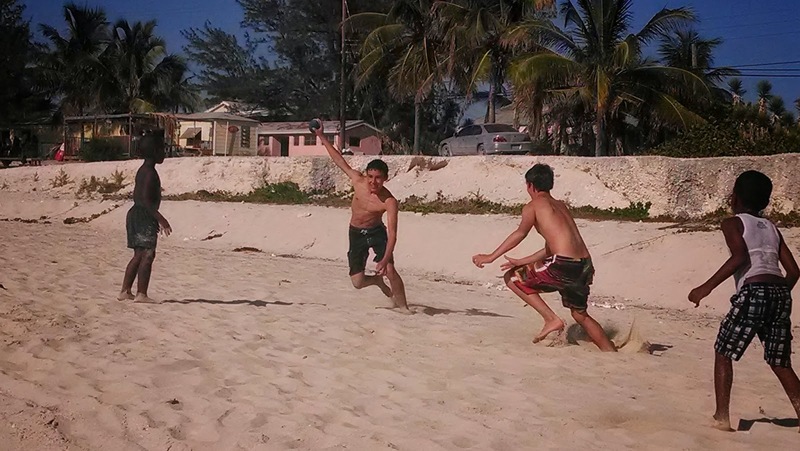 The beach was nice. The water was cool, which was relieving after being in the hot sun, and we snorkeled in the rocks. 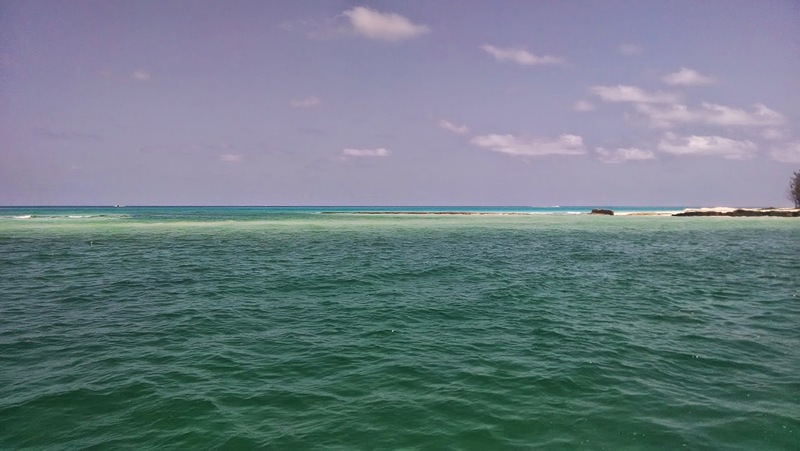 The water was so clear, and we saw many kinds of fish, ranging from tiny blue ones almost too small to see, to torpedo fish that were long and skinny, to large angelfish with string-like, black fins that trailed off behind them. We saw rays and black and white crabs. We even saw an octopus hiding inside a rock! We’re finally in the Bahamas! We have more things to blog about now, so posts should be coming out more frequently. However, net connections are harder to find here, no promises on the timing.